February 11,2019, by Markeshia Ricks- The Westville arts scene grew a little bigger with the opening of Chapel Haven’s new UARTS program and store in the heart of the village Friday afternoon. 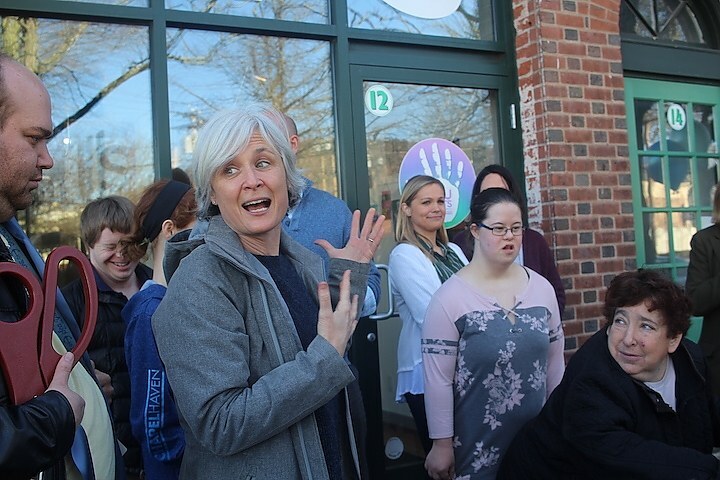 Artists in the Chapel Haven Schleifer Center joined Mayor Toni Harp and State Rep. Pat Dillon for a ribbon-cutting ceremony to celebrate the opening of the new store at 12 Fountain St. The location also will be home to Chapel Haven’s Center for Employment and Service Opportunities, which until now has been based in North Haven. Chapel Haven President Michael Storz said UARTS and the center i be a place for Chapel Haven-connected artists with different abilities to learn how to create art for sale. Though some of the art is created by individuals, most of it is created by the artists working together. What’s for sale will grow and change as the artists learn different skills. “They’re constantly learning new art skills, new crafts, new products,” he said. “They have input into the kinds of creative things they want to see. They will bring in guests who will teach skills that may be beyond all of our abilities and we will be able to learn that skill..." Click HERE to comment and read full article.